The Breaking of the Tables. Tablets containing the Ten Commandments. Moses, bidden to go up to God on the mountain to receive "tables of stone, and a law ["Torah"], and commandments ["miẓwot"]" (Ex. xxiv. 12, R. V.), is given "two tables of testimony, tables of stone, written with the finger of God" (ib. xxxi. 18) "on both their sides" (ib. xxxii. 15), "the work of God" (ib. xxxii. 16). Descending from the mount with these two tables, Moses, beholding the iniquity of the golden calf (See Calf, Golden), cast them "out of his hands and brake them" (ib. xxxii. 19). Later he was ordered by God to hew two tables of stone like unto the first; and on these God wrote the words that had been written on the original tablets (ib. xxxiv. 1-4), that is to say, the words of the covenant, the Ten Commandments (ib. xxxiv. 28). These new tables also are designated "the two tables of the testimony" (ib. xxxiv. 29). According to I Kings viii. 9, these tables of stone were put by Moses into the Ark at Horeb (ib. xxv. 10 et seq. ), and were still in it when the Solomonic Temple was dedicated. 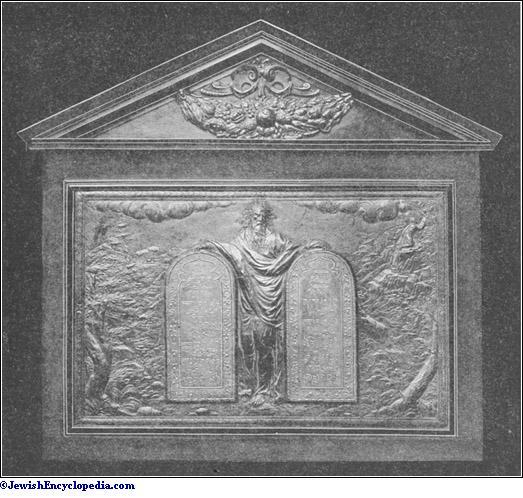 Compare Decalogue; Engraving; Revelation. The two tables furnish copious suggestions for amplifications and analogies. According to R. Berechiah, the tables were six handbreadths in length. In their delivery to Moses two handbreadths were held in the grasp of the Almighty, two constituted the distance between God and Moses, and two were seized by Moses (Ex. R. xxviii.). The number of the tables, two,corresponds to the natural coupling of pairs, such as bridegroom and bride, heaven and earth, this world and the world to come. By the circumstance that "luḥot" is written defectively without "waw," , not , the fact is indicated that the two tablets were perfectly equal (ib. xli.). The splendor of Moses' face (Ex. xxxiv. 30) was derived from the part of the tables that was between God and himself (ib. xlvii.). The first tables were given to Moses without effort on his part; the second, only after forty days of self humiliation and privations (ib.). The angels objected to the writing of the second set by Moses on the ground that he might claim to be the author of the tables or might even go so far as to change their text and content; but God trusted him implicitly (with reference to Num. xii 17; Ex. R. l.c.). Moses was commanded to write the second set, just as a royal husband who had written a matrimonial pact with his wife might, upon discovering that she had violated it, pardon her, but would most likely require her to draw up the second agreement (Deut. R. iii. ; Ex. R. l.c. ; Tan., Ki Tissa, ed. Buber, p. 117a). The word in Ex. xxxii. 16 must be pointed ("free"), indicating that death, earthly governments, and pain had no power over the Israelites, who accepted the tables (Lev. R. xviii. ; Pirḳe R. El. xlvi.). Tables of the Law from an Italian Synagogue, Dated 1671. Moses had in his tent a block of sapphire, created for the very purpose, from which he hewed the second set of tables (Pirḳe R. El, l.c.). The tables had a weight of 40 seah (Tan., l.c. p. 117b). Indeed, from the sale of the chips made in the course of the dressing of the block, Moses became rich (Ned. 38a). This sapphire was of a nature that admitted of the tables being rolled up (Ex. R. viii. ; Cant. R. v. 14). 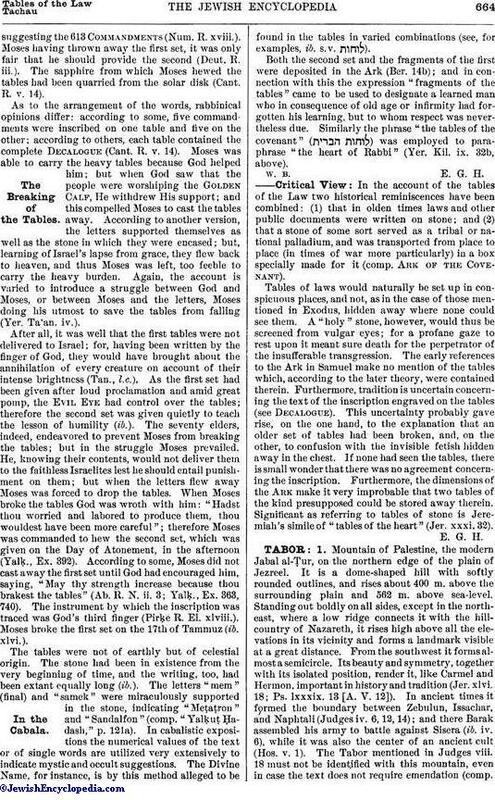 The fact that the tables were of stone is emphasized as indicating that stoning was the punishment for infractions of the laws written thereon (Tan., l.c., ed. Stettin, p. 158a). The letters of the inscription were 613 in number,suggesting the 613 Commandments (Num. R. xviii.). Moses having thrown away the first set, it was only fair that he should provide the second (Deut. R. iii.). The sapphire from which Moses hewed the tables had been quarried from the solar disk (Cant. R. v. 14). As to the arrangement of the words, rabbinical opinions differ: according to some, five commandments were inscribed on one table and five on the other; according to others, each table contained the complete Decalogue (Cant. R. v. 14). Moses was able to carry the heavy tables because God helped him; but when God saw that the people were worshiping the Golden Calf, He withdrew His support; and this compelled Moses to cast the tables away. According to another version, the letters supported themselves as well as the stone in which they were encased; but, learning of Israel's lapse from grace, they flew back to heaven, and thus Moses was left, too feeble to carry the heavy burden. Again, the account is varied to introduce a struggle between God and Moses, or between Moses and the letters, Moses doing his utmost to save the tables from falling (Yer. Ta'an. iv.). After all, it was well that the first tables were not delivered to Israel; for, having been written by the finger of God, they would have brought about the annihilation of every creature on account of their intense brightness (Tan., l.c.). As the first set had been given after loud proclamation and amid great pomp, the Evil Eye had control over the tables; therefore the second set was given quietly to teach the lesson of humility (ib.). The seventy elders, indeed, endeavored to prevent Moses from breaking the tables; but in the struggle Moses prevailed. He, knowing their contents, would not deliver them to the faithless Israelites lest he should entail punishment on them; but when the letters flew away Moses was forced to drop the tables. When Moses broke the tables God was wroth with him: "Hadst thou worried and labored to produce them, thou wouldest have been more careful"; therefore Moses was commanded to hew the second set, which was given on the Day of Atonement, in the afternoon (Yalḳ., Ex. 392). According to some, Moses did not cast away the first set until God had encouraged him, saying, "May thy strength increase because thou brakest the tables" (Ab. R. N. ii. 3; Yalḳ., Ex. 363, 740). The instrument by which the inscription was traced was God's third finger (Pirḳe R. El. xlviii.). Moses broke the first set on the 17th of Tammuz (ib. xlvi.). The tables were not of earthly but of celestial origin. The stone had been in existence from the very beginning of time, and the writing, too, had been extant equally long (ib.). The letters "mem" (final) and "samek" were miraculously supported in the stone, indicating "Meṭaṭron" and "Sandalfon" (comp. "Yalḳuṭ Ḥadash," p. 121a). In cabalistic expositions the numerical values of the text or of single words are utilized very extensively to indicate mystic and occult suggestions. The Divine Name, for instance, is by this method alleged to be found in the tables in varied combinations (see, for examples, ib. s.v. ). Both the second set and the fragments of the first were deposited in the Ark (Ber. 14b); and in connection with this the expression "fragments of the tables" came to be used to designate a learned man who in consequence of old age or infirmity had forgotten his learning, but to whom respect was nevertheless due. 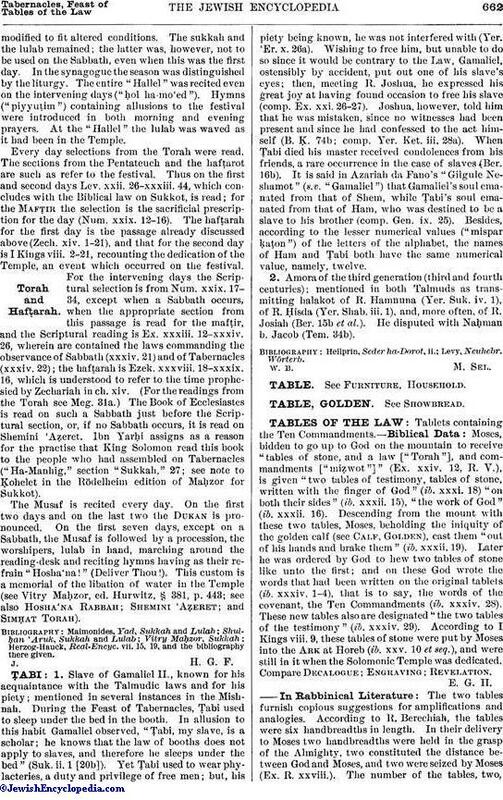 Similarly the phrase "the tables of the covenant" ( ) was employed to paraphrase "the heart of Rabbi" (Yer. Kil. ix. 32b, above). 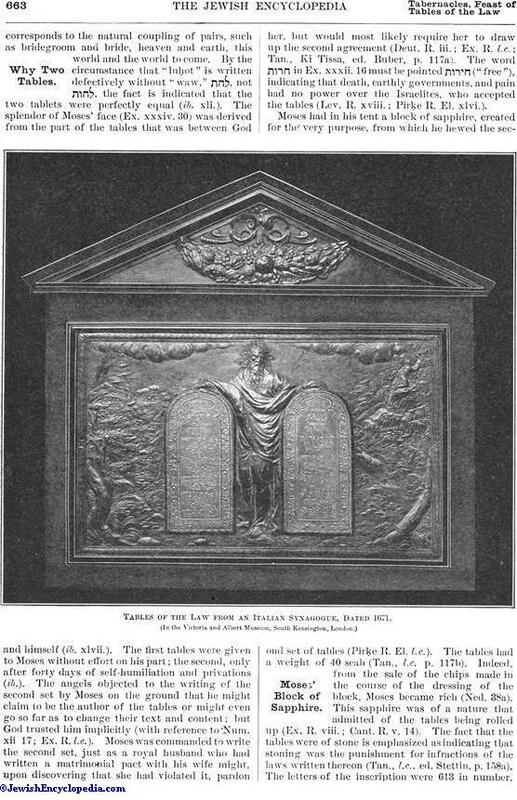 In the account of the tables of the Law two historical reminiscences have been combined: (1) that in olden times laws and other public documents were written on stone; and (2) that a stone of some sort served as a tribal or national palladium, and was transported from place to place (in times of war more particularly) in a box specially made for it (comp. Ark of the Covenant). Tables of laws would naturally be set up in conspicuous places, and not, as in the case of those mentioned in Exodus, hidden away where none could see them. A "holy" stone, however, would thus be screened from vulgar eyes; for a profane gaze to rest upon it meant sure death for the perpetrator of the insufferable transgression. The early references to the Ark in Samuel make no mention of the tables which, according to the later theory, were contained therein. Furthermore, tradition is uncertain concerning the text of the inscription engraved on the tables (see Decalogue). This uncertainty probably gave rise, on the one hand, to the explanation that an older set of tables had been broken, and, on the other, to confusion with the invisible fetish hidden away in the chest. If none had seen the tables, there is small wonder that there was no agreement concerning the inscription. Furthermore, the dimensions of the Ark make it very improbable that two tables of the kind presupposed could be stored away therein. Significant as referring to tables of stone is Jeremiah's simile of "tables of the heart" (Jer. xxxi. 32).